The blade is 14 inch. The shape and size of this khukuri is similar to Angkhola khukuri but with curve tip of blade where the channel on the blade is made in a different way. It is also called Budhune Khukuri (one of the oldest Khukuri made in Nepal). The expertise on this knife is amazing. So, if you are looking for the finest quality khukuri you can order this. This blade can be used in different purposes like jungle bush, cutting vegetable, meat, bamboo, wood and so on. The khukuri comes with 14 inches blade where the handle is 6.5 inches. The spine is 8mm and the bevel is 7mm where the widest part of the blade is 6.2cm. The weight of kukri is 1400 grams with scabbards. 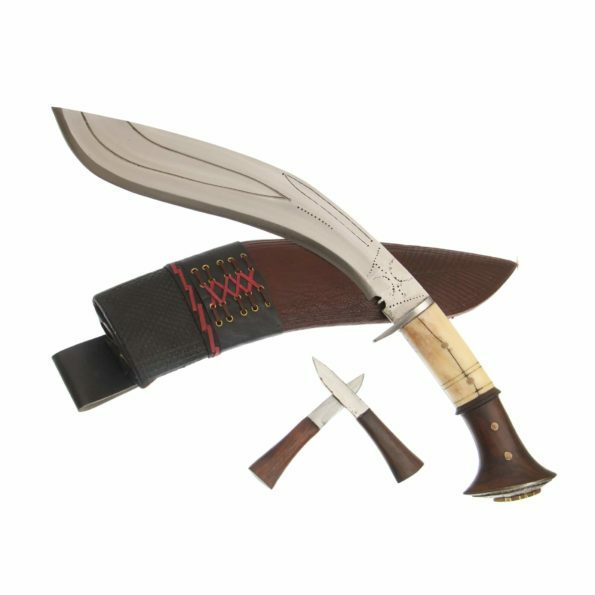 Set of Karda and Chakmak is included that are high quality small knives (Utility Knife + Sharpener). Blade Size and Type:14 Inches Hand made,unpolished blade. Handle Size: 6 Inches full tang handle made of Rose Wood. Material Used: Highly Graded Carbon Steel(5160), Water Buffalo refine Leather for Scabbard(outside) and Rosewood for the Handle, Pinewood for the Scabbard (inside), Laha( Nepali Traditional Glue). Overall length:14 inches from tip of the blade to pommel of the handle (Aprox).